In 2001, the City of Warrenville opened the doors to its new City Hall. On the first floor of the building is a long hallway designated the Leone Schmidt Hall of History. 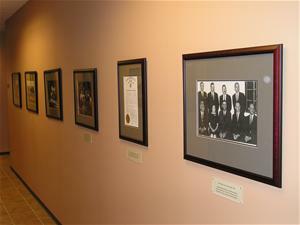 The hallway features memorable moments and people in Warrenville’s history. Upon entering the hall, visitors are greeted with comments from Warrenville residents on the “I Love Warrenville” wall. Quotes from local celebrities such as former First Gentleman Dwight Lund or Warrenville Digest co-founder Peter Natzke adorn the wall. Moving through the hallway, visitors encounter historical photographs including one of founder Colonel Julius Warren, the City’s train station, built in 1902, and a shot of downtown Warrenville in 1910. Other photographs of community events, popular locations, and local residents can be found there as well. Important documents such as the Winfield Township map, circa 1874, and the City’s incorporation document of 1967 hang in the hallway and tell their story. Photographs of the general store and post office built in 1910, Holmes School, which opened in 1913, and the first City Council of 1967 can be viewed. Further down the hallway hangs a portrait of Warrenville’s first Mayor, William T. Stafford, who held the position from 1967 to 1977 and was then an Alderman from 1979 to 1982. Photographs of various children’s sports teams that the City sponsors are displayed here along with photographs of the Police Department and the Warrenville Tunes of Glory Bagpipe Band. Visitors will also find the City Seal and a picture of the old City Hall, when it occupied the original train station. At the end of the hallway, visitors will find recognition of Warrenville’s Tree City USA status and three framed flags donated to the City by local veterans. Any visit to the City of Warrenville wouldn’t be complete without viewing the Hall of History and learning about the events and people that shaped the community.